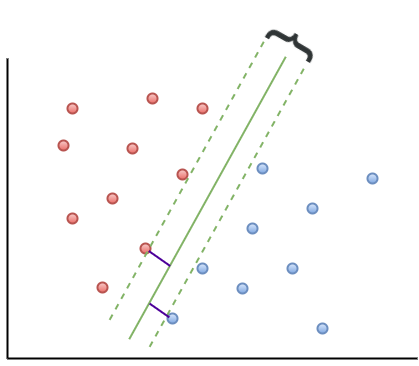 About a year ago, I wrote a piece on support vector machines as a part of my gentle introduction to data science R series. So it is perhaps appropriate to begin this piece with a few words about my motivations for writing yet another article on the topic. Late last year, a curriculum lead at DataCamp got in touch to ask whether I’d be interested in developing a course on SVMs for them. Instead of rehashing what I had done in my previous article, I thought it would be interesting to try an approach that focuses on building an intuition for how the algorithm works using examples of increasing complexity, supported by visualisation rather than math. This post is the first part of a two-part series based on this approach. 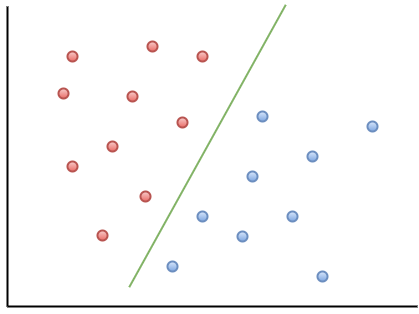 The article builds up some basic intuitions about support vector machines (abbreviated henceforth as SVM) and then focuses on linearly separable problems. Part 2 (to be released at a future date) will deal with radially separable and more complex data sets. The focus throughout is on developing an understanding what the algorithm does rather than the technical details of how it does it. 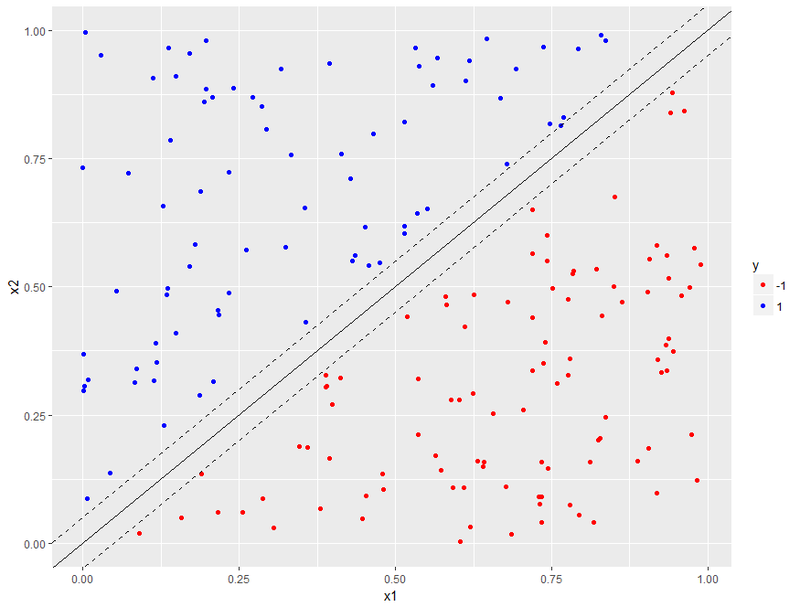 Prerequisites for this series are a basic knowledge of R and some familiarity with the ggplot package. However, even if you don’t have the latter, you should be able to follow much of what I cover so I encourage you to press on regardless. A soft drink manufacturer has two brands of their flagship product: Choke (sugar content of 11g/100ml) and Choke-R (sugar content 8g/100 ml). The actual sugar content can vary quite a bit in practice so it can sometimes be hard to figure out the brand given the sugar content. Given sugar content data for 25 samples taken randomly from both populations (see file sugar_content.xls), our task is to come up with a decision rule for determining the brand. Note that we’ve simulated a one-dimensional plot by setting all the y values to 0. From the plot, it is evident that the samples fall into distinct groups: low sugar content, bounded above by the 8.8 g/100ml sample and high sugar content, bounded below by the 10 g/100ml sample. Clearly, any point that lies between the two points is an acceptable decision boundary. We could, for example, pick 9.1g/100ml and 9.7g/100ml. Here’s the R code with those points added in. 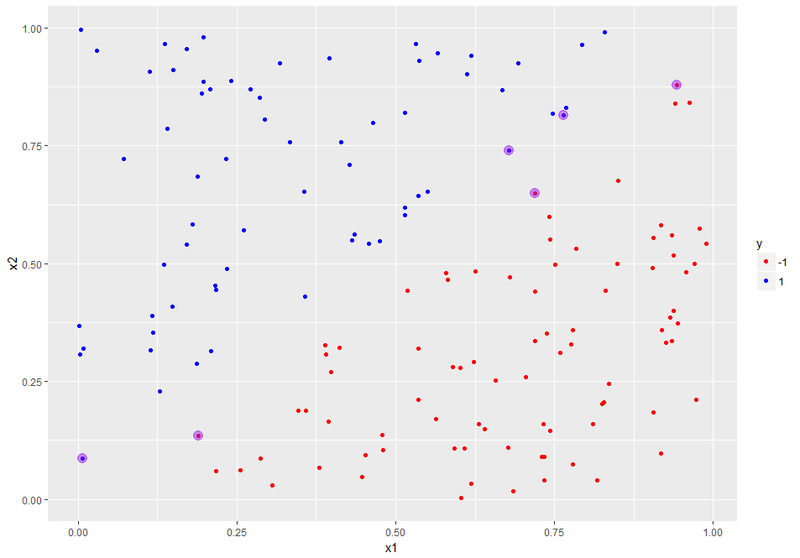 Note that we’ve made the points a bit bigger and coloured them red to distinguish them from the sample points. #p created in previous code block! The other one is left for you as an exercise. Now, it is pretty clear that although either these points define an acceptable decision boundary, neither of them are the best. Let’s try to formalise our intuitive notion as to why this is so. We are dealing with a one dimensional problem here so the decision boundary is a point. In a moment we will generalise this to a two dimensional case in which the boundary is a straight line. Let’s close this section with some general points. Remember this is a sample not the entire population, so it is quite possible (indeed likely) that there will be as yet unseen samples of Choke-R and Choke that have a sugar content greater than 8.8 and less than 10 respectively. 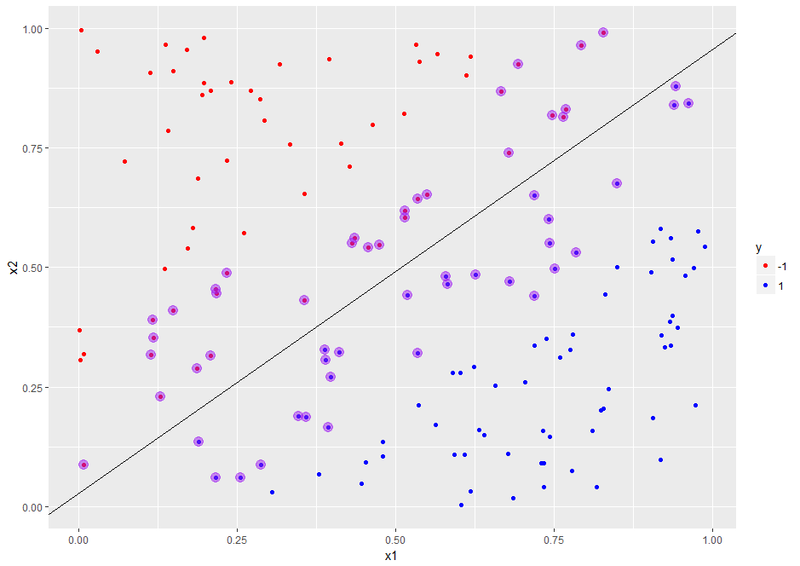 So, the best classifier is one that lies at the greatest possible distance from both classes. The maximum margin separator is that classifier. This toy example serves to illustrate the main aim of SVMs, which is to find an optimal separation boundary in the sense described here. However, doing this for real life problems is not so simple because life is not one dimensional. In the remainder of this article and its yet-to-be-written sequel, we will work through examples of increasing complexity so as to develop a good understanding of how SVMs work in addition to practical experience with using the popular SVM implementation in R.
The next level of complexity is a two dimensional case (2 predictors) in which the classes are separated by a straight line. We’ll create such a dataset next. Note that the parameters in geom_abline() are derived from the fact that the line x1=x2 has slope 1 and y intercept 0. Figure 5: Linearly separable dataset with boundary. Next let’s introduce a margin in the dataset. To do this, we need to exclude points that lie within a specified distance of the boundary. A simple way to approximate this is to exclude points that have x1 and x2 values that differ by less a pre-specified value, delta. Here’s the code to do this with delta set to 0.05 units. The check on the number of datapoints tells us that a number of points have been excluded. OK, so we have constructed a dataset that is linearly separable, which is just a short code for saying that the classes can be separated by a straight line. 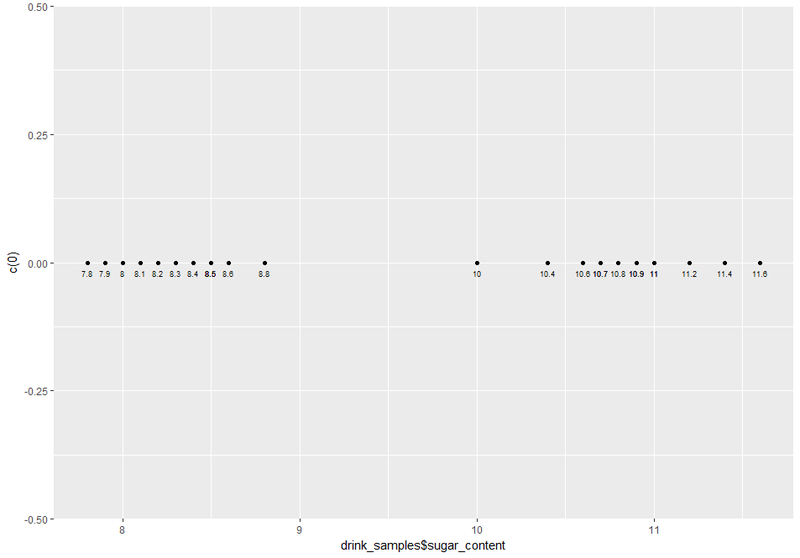 Further, the dataset has a margin, i.e. there is a “gap” so to speak, between the classes. Let’s save the dataset so that we can use it in the next section where we’ll take a first look at the svm() function in the e1071 package. 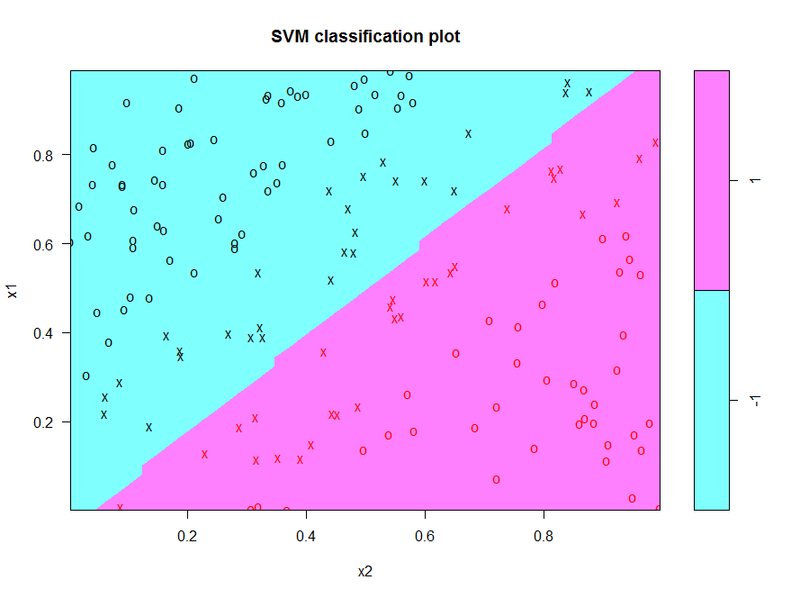 The next step is to build the an SVM classifier model. We will do this using the svm() function which is available in the e1071 package. The svm() function has a range of parameters. I explain some of the key ones below, in particular, the following parameters: type, cost, kernel and scale. It is recommended to have a browse of the documentation for more details. The type parameter specifies the algorithm to be invoked by the function. The algorithm is capable of doing both classification and regression. We’ll focus on classification in this article. Note that there are two types of classification algorithms, nu and C classification. They essentially differ in the way that they penalise margin and boundary violations, but can be shown to lead to equivalent results. We will stick with C classification as it is more commonly used. The “C” refers to the cost which we discuss next. The cost parameter specifies the penalty to be applied for boundary violations. This parameter can vary from 0 to infinity (in practice a large number compared to 0, say 10^6 or 10^8). We will explore the effect of varying cost later in this piece. To begin with, however, we will leave it at its default value of 1. The kernel parameter specifies the kind of function to be used to construct the decision boundary. The options are linear, polynomial and radial. In this article we’ll focus on linear kernels as we know the decision boundary is a straight line. The scale parameter is a Boolean that tells the algorithm whether or not the datapoints should be scaled to have zero mean and unit variance (i.e. shifted by the mean and scaled by the standard deviation). Scaling is generally good practice to avoid undue influence of attributes that have unduly large numeric values. However, in this case we will avoid scaling as we know the attributes are bounded and (more important) we would like to plot the boundary obtained from the algorithm manually. We now see that the support vectors are clustered around the boundary and, in a sense, serve to define it. We will see this more clearly by plotting the predicted decision boundary. To do this, we need its slope and intercept. These aren’t available directly available in the svm_model, but they can be extracted from the coefs, SV and rho elements of the object. The first step is to use coefs and the support vectors to build the what’s called the weight vector. The weight vector is given by the product of the coefs matrix with the matrix containing the SVs. Note that the fact that only the support vectors play a role in defining the boundary is consistent with our expectation that the boundary should be fully specified by them. Indeed, this is often touted as a feature of SVMs in that it is one of the few classifiers that depends on only a small subset of the training data, i.e. the datapoints closest to the boundary rather than the entire dataset. The plot clearly shows how the support vectors “support” the boundary – indeed, if one draws line segments from each of the points to the boundary in such a way that the intersect the boundary at right angles, the lines can be thought of as “holding the boundary in place”. Hence the term support vector. The svm plot function takes a formula specifying the plane on which the boundary is to be plotted. This is not necessary here as we have only two predictors (x1 and x2) which automatically define a plane. I’ll leave you to calculate the training and test accuracies (as one might expect, these will be perfect). The number of support vectors is reduced from 55 to 6! 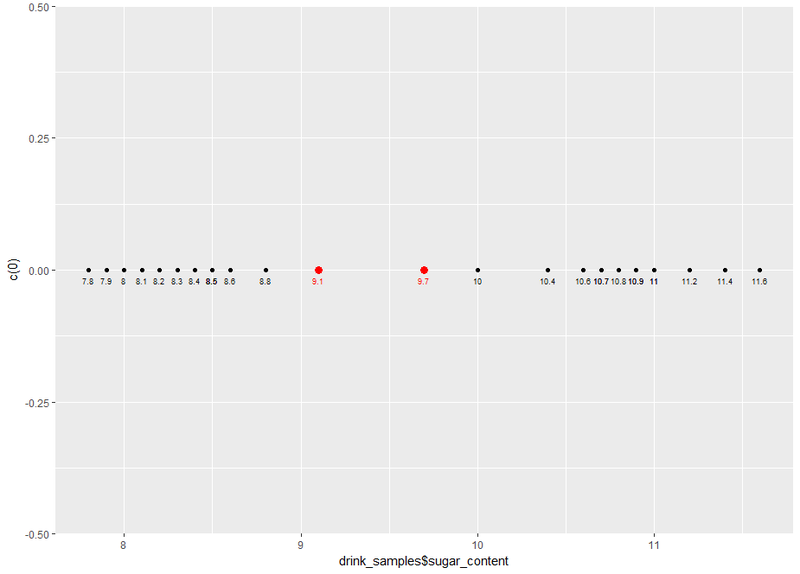 We can plot these and the boundary / margin lines using ggplot as before. The code is identical to the previous case (see code block preceding Figure 8). If you run it, you will get the plot shown in Figure 12. Which nicely confirms our expectation. SVMs that allow margin violations are called soft margin classifiers and those that do not are called hard. In this case, the hard margin classifier does a better job because it specifies the boundary more accurately than its soft counterpart. However, this does not mean that hard margin classifier are to be preferred over soft ones in all situations. Indeed, in real life, where we usually do not know the shape of the decision boundary upfront, soft margin classifiers can allow for a greater degree of uncertainty in the decision boundary thus improving generalizability of the classifier. OK, so now we have a good feel for what the SVM algorithm does in the linearly separable case. We will round out this article by looking at a real world dataset that fortuitously turns out to be almost linearly separable: the famous (notorious?) iris dataset. It is instructive to look at this dataset because it serves to illustrate another feature of the e1071 SVM algorithm – its capability to handle classification problems that have more than 2 classes. On this plane we see a clear linear boundary between setosa and the other two species, versicolor and virginica. The boundary between the latter two is almost linear. Since there are four predictors, one would have to plot the other combinations to get a better feel for the data. I’ll leave this as an exercise for you and move on with the assumption that the data is nearly linearly separable. If the assumption is grossly incorrect, a linear SVM will not work well. Which is not too bad at all, indicating that the dataset is indeed nearly linearly separable. If you try different values of cost you will see that it does not make much difference to the average accuracy. This is a good note to close this piece on. 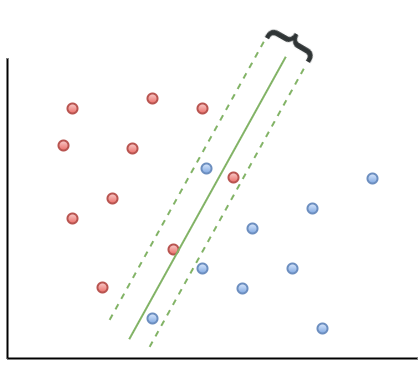 Those who have access to DataCamp premium courses will find that the content above is covered in chapters 1 and 2 of the course on support vector machines in R. The next article in this two-part series will cover chapters 3 and 4. My main objective in this article was to help develop an intuition for how SVMs work in simple cases. We illustrated the basic principles and terminology with a simple 1 dimensional example and then worked our way to linearly separable binary classification problems with multiple predictors. We saw how the latter can be solved using a popular svm implementation available in R. We also saw that the algorithm can handle multiclass problems. All through, we used visualisations to see what the algorithm does and how the key parameters affect the decision boundary and margins. In the next part (yet to be written) we will see how SVMs can be generalised to deal with complex, nonlinear decision boundaries. In essence, the use a mathematical trick to “linearise” these boundaries. We’ll delve into details of this trick in an intuitive, visual way as we have done here. In this day and age of artificial intelligence and deep learning, it is easy to forget that simple algorithms can work well for a surprisingly large range of practical business problems. And the simplest place to start is with the granddaddy of data science algorithms: linear regression and its close cousin, logistic regression. Indeed, in his acclaimed MOOC and accompanying textbook, Yaser Abu-Mostafa spends a good portion of his time talking about linear methods, and with good reason too: linear methods are not only a good way to learn the key principles of machine learning, they can also be remarkably helpful in zeroing in on the most important predictors. My main aim in this post is to provide a beginner level introduction to logistic regression using R and also introduce LASSO (Least Absolute Shrinkage and Selection Operator), a powerful feature selection technique that is very useful for regression problems. 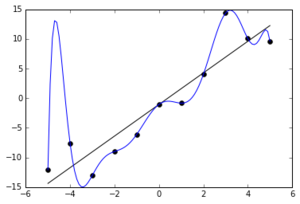 Lasso is essentially a regularization method. If you’re unfamiliar with the term, think of it as a way to reduce overfitting using less complicated functions (and if that means nothing to you, check out my prelude to machine learning). One way to do this is to toss out less important variables, after checking that they aren’t important. As we’ll discuss later, this can be done manually by examining p-values of coefficients and discarding those variables whose coefficients are not significant. However, this can become tedious for classification problems with many independent variables. In such situations, lasso offers a neat way to model the dependent variable while automagically selecting significant variables by shrinking the coefficients of unimportant predictors to zero. All this without having to mess around with p-values or obscure information criteria. How good is that? 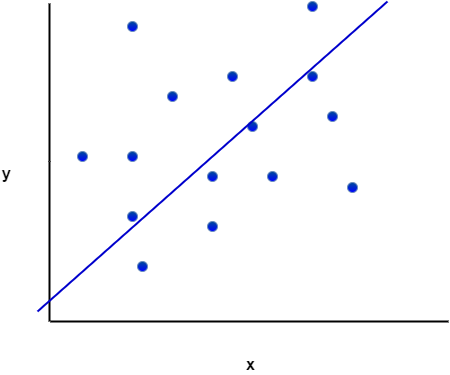 In linear regression one attempts to model a dependent variable (i.e. the one being predicted) using the best straight line fit to a set of predictor variables. The best fit is usually taken to be one that minimises the root mean square error, which is the sum of square of the differences between the actual and predicted values of the dependent variable. One can think of logistic regression as the equivalent of linear regression for a classification problem. In what follows we’ll look at binary classification – i.e. a situation where the dependent variable takes on one of two possible values (Yes/No, True/False, 0/1 etc.). First up, you might be wondering why one can’t use linear regression for such problems. 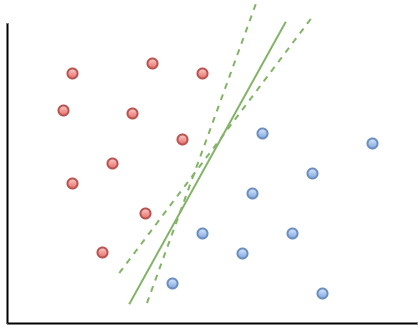 The main reason is that classification problems are about determining class membership rather than predicting variable values, and linear regression is more naturally suited to the latter than the former. One could, in principle, use linear regression for situations where there is a natural ordering of categories like High, Medium and Low for example. 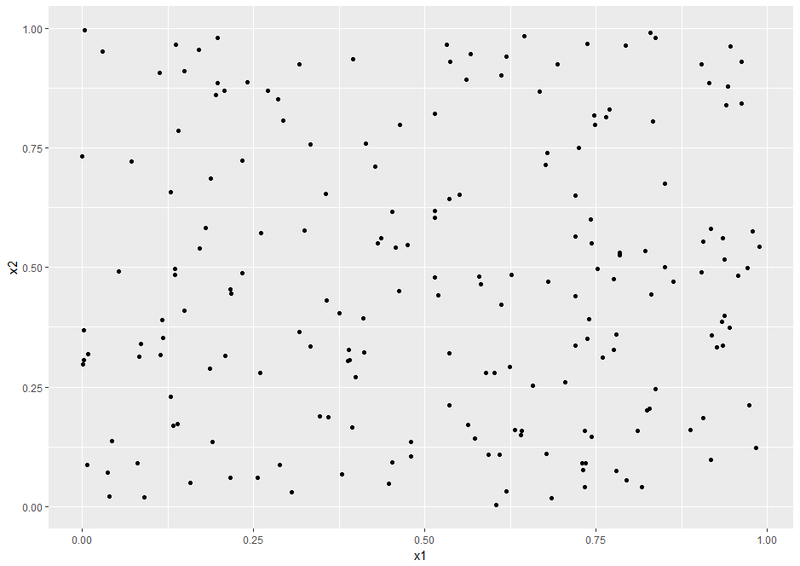 However, one then has to map sub-ranges of the predicted values to categories. Moreover, since predicted values are potentially unbounded (in data as yet unseen) there remains a degree of arbitrariness associated with such a mapping. Logistic regression sidesteps the aforementioned issues by modelling class probabilities instead. Any input to the model yields a number lying between 0 and 1, representing the probability of class membership. One is still left with the problem of determining the threshold probability, i.e. the probability at which the category flips from one to the other. By default this is set to p=0.5, but in reality it should be settled based on how the model will be used. For example, for a marketing model that identifies potentially responsive customers, the threshold for a positive event might be set low (much less than 0.5) because the client does not really care about mailouts going to a non-responsive customer (the negative event). Indeed they may be more than OK with it as there’s always a chance – however small – that a non-responsive customer will actually respond. As an opposing example, the cost of a false positive would be high in a machine learning application that grants access to sensitive information. In this case, one might want to set the threshold probability to a value closer to 1, say 0.9 or even higher. The point is, the setting an appropriate threshold probability is a business issue, not a technical one. So how does logistic regression work? For the discussion let’s assume that the outcome (predicted variable) and predictors are denoted by Y and X respectively and the two classes of interest are denoted by + and – respectively. We wish to model the conditional probability that the outcome Y is +, given that the input variables (predictors) are X. The conditional probability is denoted by p(Y=+|X) which we’ll abbreviate as p(X) since we know we are referring to the positive outcome Y=+. You can verify that does indeed lie between 0 and 1 as varies from to . Typically, however, the values of that make sense are bounded as shown in the example (stolen from Wikipedia) shown in Figure 1. 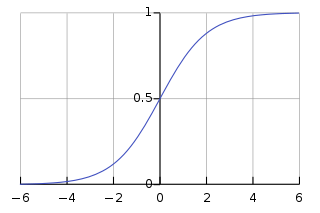 The figure also illustrates the typical S-shaped curve characteristic of logistic regression. The quantity on the left is the logarithm of the odds. So, the model is a linear regression of the log-odds, sometimes called logit, and hence the name logistic. Where represents the products over i and j, which run over the +ve and –ve classed points respectively. This approach, called maximum likelihood estimation, is quite common in many machine learning settings, especially those involving probabilities. However, these are technical details that I mention only for completeness. As you will see next, they have little bearing on the practical use of logistic regression. In this example, we’ll use the logistic regression option implemented within the glm function that comes with the base R installation. This function fits a class of models collectively known as generalized linear models. We’ll apply the function to the Pima Indian Diabetes dataset that comes with the mlbench package. The code is quite straightforward – particularly if you’ve read earlier articles in my “gentle introduction” series – so I’ll just list the code below noting that the logistic regression option is invoked by setting family=”binomial” in the glm function call. #which classes do these probabilities refer to? What are 1 and 0? Column 2 in the table lists coefficient estimates. The last column (Pr(>|z|) lists the p-value, which is the probability of getting the listed estimate assuming the predictor has no effect. In essence, the smaller the p-value, the more significant the estimate is likely to be. In this case we have only 9 variables, so are able to identify the significant ones by a manual inspection of p-values. As you can well imagine, such a process will quickly become tedious as the number of predictors increases. Wouldn’t it be be nice if there were an algorithm that could somehow automatically shrink the coefficients of these variables or (better!) set them to zero altogether? It turns out that this is precisely what lasso and its close cousin, ridge regression, do. Where is a free parameter which is usually selected in such a way that the resulting model minimises the out of sample error. Typically, the optimal value of is found using grid search with cross-validation, a process akin to the one described in my discussion on cost-complexity parameter estimation in decision trees. Most canned algorithms provide methods to do this; the one we’ll use in the next section is no exception. In the case of ridge regression, the effect of the penalty term is to shrink the coefficients that contribute most to the error. Put another way, it reduces the magnitude of the coefficients that contribute to increasing . In contrast, in the case of lasso regression, the effect of the penalty term is to set the these coefficients exactly to zero! This is cool because what it mean that lasso regression works like a feature selector that picks out the most important coefficients, i.e. those that are most predictive (and have the lowest p-values). where controls the “mix” of ridge and lasso regularisation, with being “pure” ridge and being “pure” lasso. does not have a formula interface, so one has to input the predictors as a matrix and the class labels as a vector. does not accept categorical predictors, so one has to convert these to numeric values before passing them to glmnet. The glmnet function model.matrix creates the matrix and also converts categorical predictors to appropriate dummy variables. Another important point to note is that we’ll use the function cv.glmnet, which automatically performs a grid search to find the optimal value of . 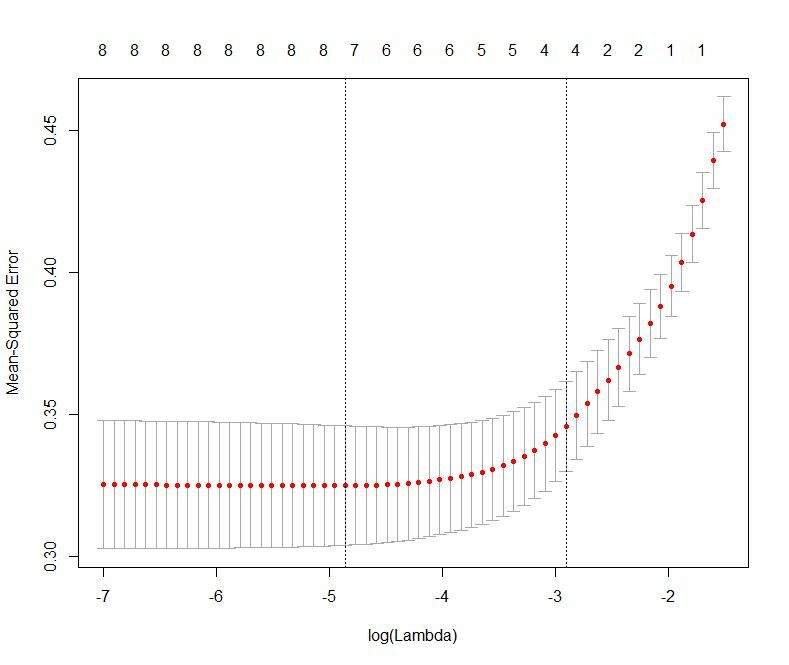 The plot shows that the log of the optimal value of lambda (i.e. the one that minimises the root mean square error) is approximately -5. The exact value can be viewed by examining the variable lambda_min in the code below. In general though, the objective of regularisation is to balance accuracy and simplicity. In the present context, this means a model with the smallest number of coefficients that also gives a good accuracy. To this end, the cv.glmnet function finds the value of lambda that gives the simplest model but also lies within one standard error of the optimal value of lambda. This value of lambda (lambda.1se) is what we’ll use in the rest of the computation. Interested readers should have a look at this article for more on lambda.1se vs lambda.min. Which is a bit less than what we got with the more complex model. So, we get a similar out-of-sample accuracy as we did before, and we do so using a way simpler function (4 non-zero coefficients) than the original one (9 nonzero coefficients). What this means is that the simpler function does at least as good a job fitting the signal in the data as the more complicated one. The bias-variance tradeoff tells us that the simpler function should be preferred because it is less likely to overfit the training data. Paraphrasing William of Ockham: all other things being equal, a simple hypothesis should be preferred over a complex one. In this post I have tried to provide a detailed introduction to logistic regression, one of the simplest (and oldest) classification techniques in the machine learning practitioners arsenal. Despite it’s simplicity (or I should say, because of it!) 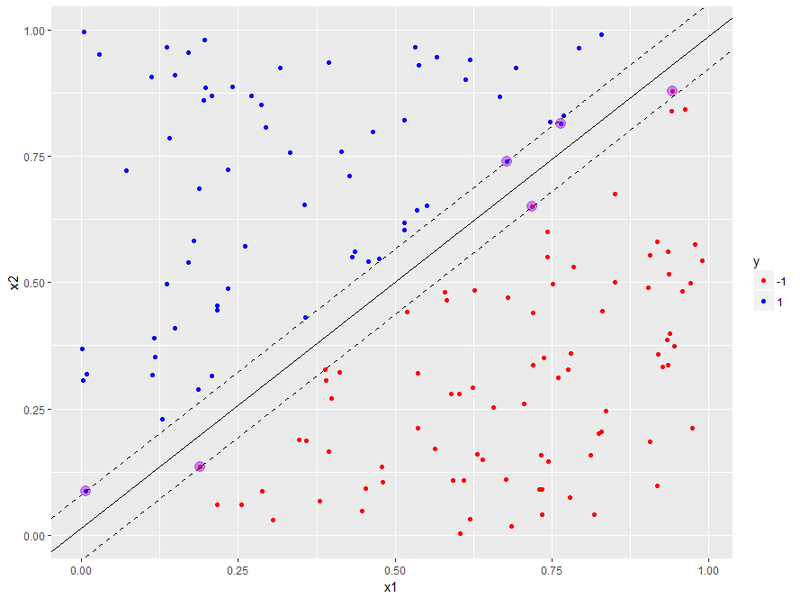 logistic regression works well for many business applications which often have a simple decision boundary. Moreover, because of its simplicity it is less prone to overfitting than flexible methods such as decision trees. Further, as we have shown, variables that contribute to overfitting can be eliminated using lasso (or ridge) regularisation, without compromising out-of-sample accuracy. Given these advantages and its inherent simplicity, it isn’t surprising that logistic regression remains a workhorse for data scientists. If you show a picture to a three-year-old and ask if there’s a tree in it, you will likely get a correct answer. If you ask a thirty year old what the definition of a tree is, you will likely get an inconclusive answer. We didn’t learn what a tree is by studying a [model] of what trees [are]. We learned by looking at trees. In other words, we learned from data. In other words, the three year old forms a model of what constitutes a tree through a process of discerning a common pattern between all objects that grown-ups around her label “trees.” (the data). She can then “predict” that something is (or is not) a tree by applying this model to new instances presented to her. This is exactly what happens in machine learning: the computer (or more correctly, the algorithm) builds a predictive model of a variable (like “treeness”) based on patterns it discerns in data. The model can then be applied to predict the value of the variable (e.g. is it a tree or not) in new instances. With that said for an introduction, it is worth contrasting this machine-driven process of model building with the traditional approach of building mathematical models to predict phenomena as in, say, physics and engineering. What are models good for? Physicists and engineers model phenomena using physical laws and mathematics. The aim of such modelling is both to understand and predict natural phenomena. For example, a physical law such as Newton’s Law of Gravitation is itself a model – it helps us understand how gravity works and make predictions about (say) where Mars is going to be six months from now. Indeed, all theories and laws of physics are but models that have wide applicability. A model of a real world process or phenomenon is necessarily a simplification. This is essentially because it is impossible to isolate a process or phenomenon from the rest of the world. As a consequence it is impossible to know for certain that the model one has built has incorporated all the interactions that influence the process / phenomenon of interest. It is quite possible that potentially important variables have been overlooked. The selection of variables that go into a model is based on assumptions. In the case of model building in physics, these assumptions are made upfront and are thus clear to anybody who takes the trouble to read the underlying theory. In machine learning, however, the assumptions are harder to see because they are implicit in the data and the algorithm. This can be a problem when data is biased or an algorithm opaque. Problem of bias and opacity become more acute as datasets increase in size and algorithms become more complex, especially when applied to social issues that have serious human consequences. I won’t go into this here, but for examples the interested reader may want to have a look at Cathy O’Neil’s book, Weapons of Math Destruction, or my article on the dark side of data science. As an aside, I should point out that although assumptions are usually obvious in traditional modelling, they are often overlooked out of sheer laziness or, more charitably, lack of awareness. This can have disastrous consequences. The global financial crisis of 2008 can – to some extent – be blamed on the failure of trading professionals to understand assumptions behind the model that was used to calculate the value of collateralised debt obligations. It all starts with a straight line…. Now that we’ve taken a tour of some of the key differences between model building in the old and new worlds, we are all set to start talking about machine learning proper. I should begin by admitting that I overstated the point about opacity: there are some machine learning algorithms that are transparent as can possibly be. Indeed, chances are you know the algorithm I’m going to discuss next, either from an introductory statistics course in university or from plotting relationships between two variables in your favourite spreadsheet. Yea, you may have guessed that I’m referring to linear regression. 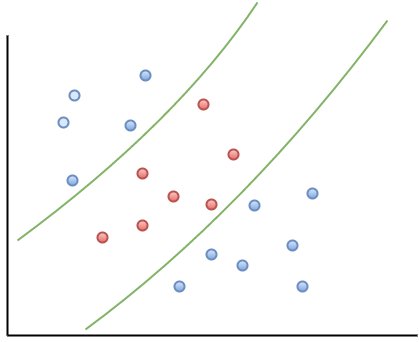 In its simplest avatar, linear regression attempts to fit a straight line to a set of data points in two dimensions. The two dimensions correspond to a dependent variable (traditionally denoted by ) and an independent variable (traditionally denoted by ). 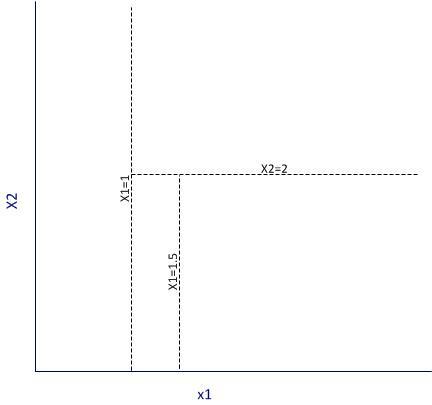 An example of such a fitted line is shown in Figure 1. Once such a line is obtained, one can “predict” the value of the dependent variable for any value of the independent variable. In terms of our earlier discussion, the line is the model. Figure 1 also serves to illustrate that linear models are going to be inappropriate in most real world situations (the straight line does not fit the data well). But it is not so hard to devise methods to fit more complicated functions. The important point here is that since machine learning is about finding functions that accurately predict dependent variables for as yet unknown values of the independent variables, most algorithms make explicit or implicit choices about the form of these functions. At first sight it seems a no-brainer that complicated functions will work better than simple ones. After all, if we choose a nonlinear function with lots of parameters, we should be able to fit a complex data set better than a linear function can (See Figure 2 – the complicated function fits the datapoints better than the straight line). But there’s catch: although the ability to fit a dataset increases with the flexibility of the fitting function, increasing complexity beyond a point will invariably reduce predictive power. Put another way, a complex enough function may fit the known data points perfectly but, as a consequence, will inevitably perform poorly on unknown data. This is an important point so let’s look at it in greater detail. Recall that the aim of machine learning is to predict values of the dependent variable for as yet unknown values of the independent variable(s). Given a finite (and usually, very limited) dataset, how do we build a model that we can have some confidence in? The usual strategy is to partition the dataset into two subsets, one containing 60 to 80% of the data (called the training set) and the other containing the remainder (called the test set). The model is then built – i.e. an appropriate function fitted – using the training data and verified against the test data. The verification process consists of comparing the predicted values of the dependent variable with the known values for the test set. Now, it should be intuitively clear that the more complicated the function, the better it will fit the training data. Answer: Because complicated functions have more free parameters – for example, linear functions of a single (dependent) variable have two parameters (slope and intercept), quadratics have three, cubics four and so on. The mathematician, John von Neumann is believed to have said, “With four parameters I can fit an elephant, and with five I can make him wiggle his trunk.” See this post for a nice demonstration of the literal truth of his words. Put another way, complex functions are wrigglier than simple ones, and – by suitable adjustment of parameters – their “wriggliness” can be adjusted to fit the training data better than functions that are less wriggly. Figure 2 illustrates this point well. This may sound like you can have your cake and eat it too: choose a complicated enough function and you can fit both the training and test data well. Not so! Keep in mind that the resulting model (fitted function) is built using the training set alone, so a good fit to the test data is not guaranteed. In fact, it is intuitively clear that a function that fits the training data perfectly (as in Figure 2) is likely to do a terrible job on the test data. Answer: Remember, as far as the model is concerned, the test data is unknown. Hence, the greater the wriggliness in the trained model, the less likely it is to fit the test data well. Remember, once the model is fitted to the training data, you have no freedom to tweak parameters any further. This tension between simplicity and complexity of models is one of the key principles of machine learning and is called the bias-variance tradeoff. Bias here refers to lack of flexibility and variance, the reducible error. In general simpler functions have greater bias and lower variance and complex functions, the opposite. Much of the subtlety of machine learning lies in developing an understanding of how to arrive at the right level of complexity for the problem at hand – that is, how to tweak parameters so that the resulting function fits the training data just well enough so as to generalise well to unknown data. Note: those who are curious to learn more about the bias-variance tradeoff may want to have a look at this piece. For details on how to achieve an optimal tradeoff, search for articles on regularization in machine learning. The discussion thus far has focused primarily on quantitative or enumerable data (numbers and categories) that’s stored in a structured format – i.e. as columns and rows in a spreadsheet or database table). This is fine as it goes, but the fact is that much of the data in organisations is unstructured, the most common examples being text documents and audio-visual media. This data is virtually impossible to analyse computationally using relational database technologies (such as SQL) that are commonly used by organisations. The situation has changed dramatically in the last decade or so. Text analysis techniques that once required expensive software and high-end computers have now been implemented in open source languages such as Python and R, and can be run on personal computers. For problems that require computing power and memory beyond that, cloud technologies make it possible to do so cheaply. In my opinion, the ability to analyse textual data is the most important advance in data technologies in the last decade or so. It unlocks a world of possibilities for the curious data analyst. Just think, all those comment fields in your survey data can now be analysed in a way that was never possible in the relational world! There is a general impression that text analysis is hard. Although some of the advanced techniques can take a little time to wrap one’s head around, the basics are simple enough. Yea, I really mean that – for proof, check out my tutorial on the topic. I could go on for a while. Indeed, I was planning to delve into a few algorithms of increasing complexity (from regression to trees and forests to neural nets) and then close with a brief peek at some of the more recent headline-grabbing developments like deep learning. However, I realised that such an exploration would be too long and (perhaps more importantly) defeat the main intent of this piece which is to give starting students an idea of what machine learning is about, and how it differs from preexisting techniques of data analysis. I hope I have succeeded, at least partially, in achieving that aim. For those who are interested in learning more about machine learning algorithms, I can suggest having a look at my “Gentle Introduction to Data Science using R” series of articles. Start with the one on text analysis (link in last line of previous section) and then move on to clustering, topic modelling, naive Bayes, decision trees, random forests and support vector machines. I’m slowly adding to the list as I find the time, so please do check back again from time to time. Note: This post is written as an introduction to the Data, Algorithms and Meaning subject that is part of the core curriculum of the Master of Data Science and Innovation program at UTS. I’m co-teaching the subject in Autumn 2018 with Alex Scriven and Rory Angus. 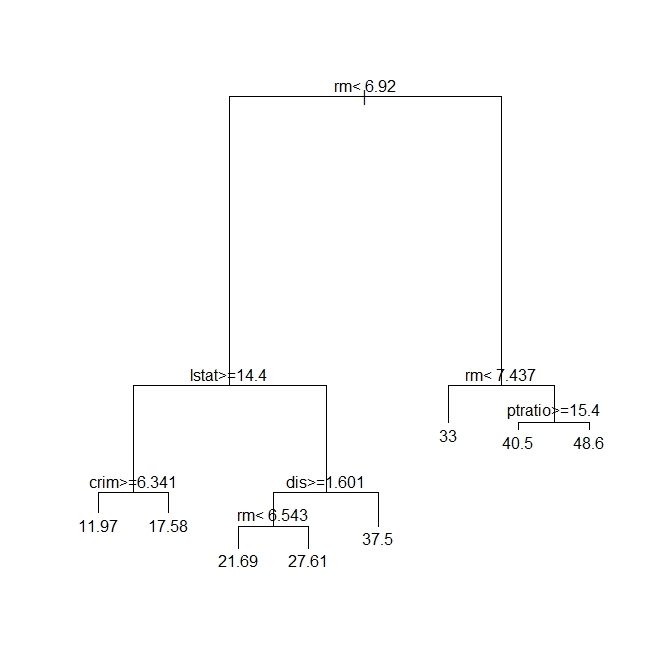 In a previous post, I described how decision tree algorithms work and demonstrated their use via the rpart library in R. Decision trees work by splitting a dataset recursively. That is, subsets arising from a split are further split until a predetermined termination criterion is reached. At each step, a split is made based on the independent variable that results in the largest possible reduction in heterogeneity of the dependent variable. The main drawback of decision trees is that they are prone to overfitting. The reason for this is that trees, if grown deep, are able to fit all kinds of variations in the data, including noise. Although it is possible to address this partially by pruning, the result often remains less than satisfactory. This is because the algorithm makes a locally optimal choice at each split without any regard to whether the choice made is the best one overall. A poor split made in the initial stages can thus doom the model, a problem that cannot be fixed by post-hoc pruning. In this post I describe random forests, a tree-based algorithm that addresses the above shortcoming of decision trees. I’ll first describe the intuition behind the algorithm via an analogy and then do a demo using the R randomForest library. One of the reasons for the popularity of decision trees is that they reflect the way humans make decisions: by weighing up options at each stage and choosing the best one available. The analogy is particularly useful because it also suggests how decision trees can be improved. People have different experiences and will therefore draw upon different “data” to answer the question. People have different knowledge bases and preferences and will therefore draw upon different “variables” to make their choices at each stage in their decision process. Different sets of training data. 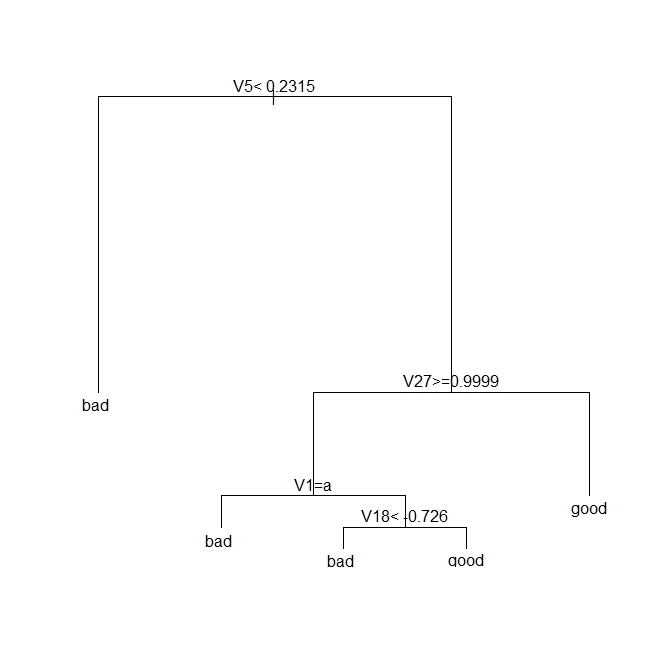 Randomly selected subsets of variables at each split of every decision tree. 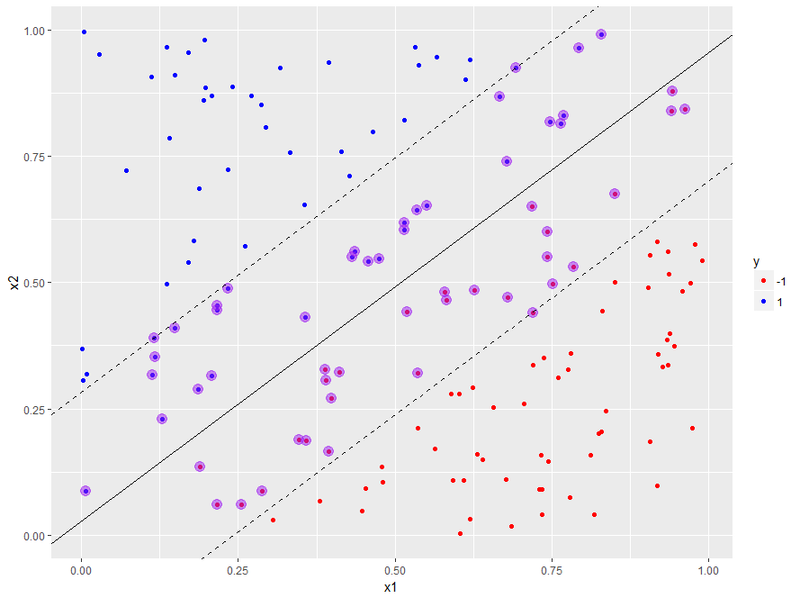 Predictions can then made by taking the majority vote over all trees (for classification problems) or averaging results over all trees (for regression problems). This is essentially how the random forest algorithm works. The net effect of the two strategies is to reduce overfitting by a) averaging over trees created from different samples of the dataset and b) decreasing the likelihood of a small set of strong predictors dominating the splits. The price paid is reduced interpretability as well as increased computational complexity. But then, there is no such thing as a free lunch. Although we will not delve into the mathematical details of the algorithm, it is important to understand how two points made above are implemented in the algorithm. A key feature of the algorithm is the use of multiple datasets for training individual decision trees. This is done via a neat statistical trick called bootstrap aggregating (also called bagging). Assume you have a dataset of size N. From this you create a sample (i.e. 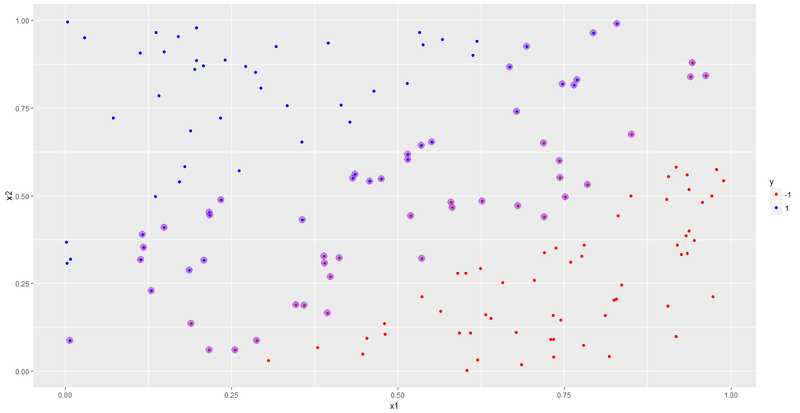 a subset) of size n (n less than or equal to N) by choosing n data points randomly with replacement. “Randomly” means every point in the dataset is equally likely to be chosen and “with replacement” means that a specific data point can appear more than once in the subset. Do this M times to create M equally-sized samples of size n each. It can be shown that this procedure, which statisticians call bootstrapping, is legit when samples are created from large datasets – that is, when N is large. Because a bagged sample is created by selection with replacement, there will generally be some points that are not selected. In fact, it can be shown that, on the average, each sample will use about two-thirds of the available data points. This gives us a clever way to estimate the error as part of the process of model building. 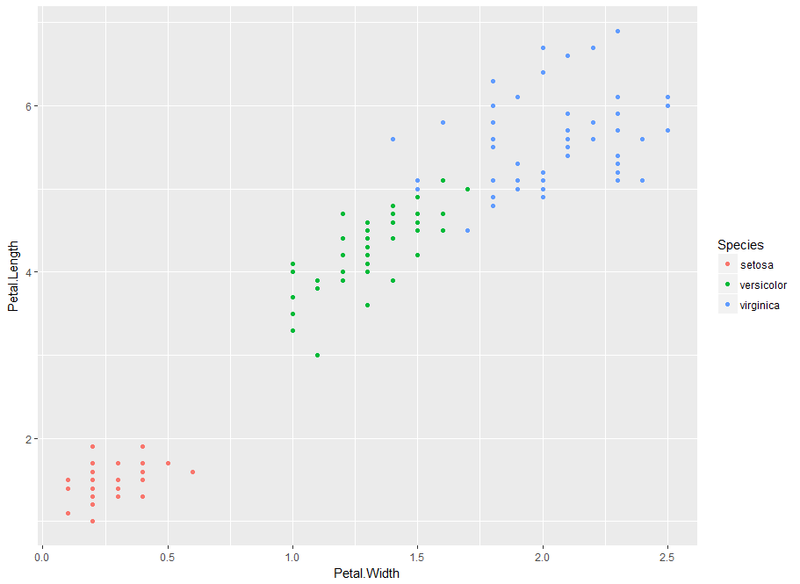 For every data point, obtain predictions for trees in which the point was out of bag. From the result mentioned above, this will yield approximately M/3 predictions per data point (because a third of the data points are out of bag). Take the majority vote of these M/3 predictions as the predicted value for the data point. One can do this for the entire dataset. From these out of bag predictions for the whole dataset, we can estimate the overall error by computing a classification error (Count of correct predictions divided by N) for classification problems or the root mean squared error for regression problems. This means there is no need to have a separate test data set, which is kind of cool. However, if you have enough data, it is worth holding out some data for use as an independent test set. This is what we’ll do in the demo later. Although bagging reduces overfitting somewhat, it does not address the issue completely. The reason is that in most datasets a small number of predictors tend to dominate the others. These predictors tend to be selected in early splits and thus influence the shapes and sizes of a significant fraction of trees in the forest. That is, strong predictors enhance correlations between trees which tends to come in the way of variance reduction. A simple way to get around this problem is to use a random subset of variables at each split. This avoids over-representation of dominant variables and thus creates a more diverse forest. This is precisely what the random forest algorithm does. In what follows, I use the famous Glass dataset from the mlbench library. 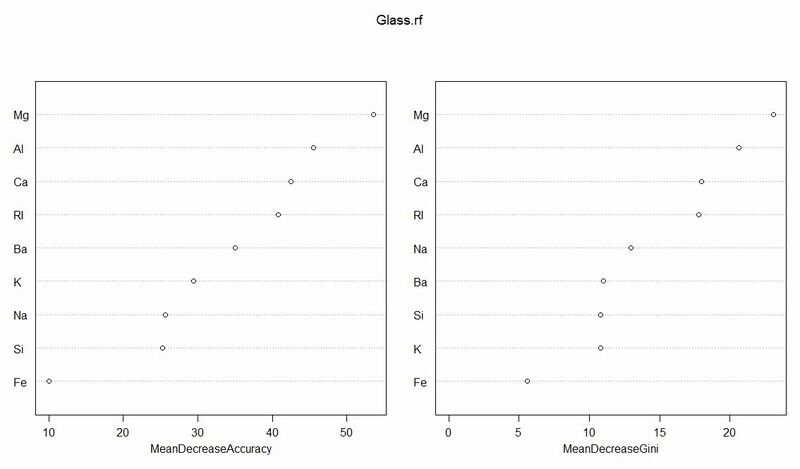 The dataset has 214 data points of six types of glass with varying metal oxide content and refractive indexes. I’ll first build a decision tree model based on the data using the rpart library (recursive partitioning) that I covered in an earlier article and then use then show how one can build a random forest model using the randomForest library. The rationale behind this is to compare the two models – single decision tree vs random forest. In the interests of space, I won’t explain details of the rpart here as I’ve covered it at length in the previous article. However, for completeness, I’ll list the demo code for it before getting into random forests. 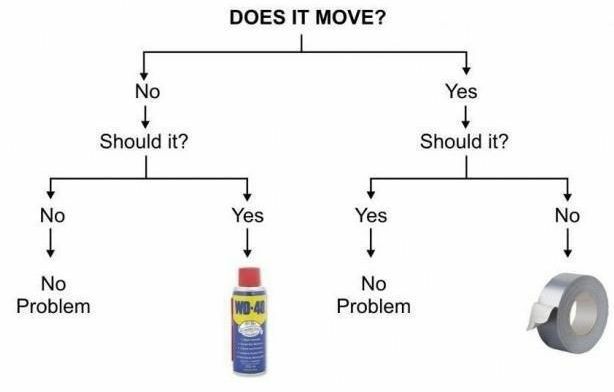 Here’s the code listing for building a decision tree using rpart on the Glass dataset (please see my previous article for a full explanation of each step). Note that I have not used pruning as there is little benefit to be gained from it (Exercise for the reader: try this for yourself!). Now, we know that decision tree algorithms tend to display high variance so the hit rate from any one tree is likely to be misleading. To address this we’ll generate a bunch of trees using different training sets (via random sampling) and calculate an average hit rate and spread (or standard deviation). The decision tree algorithm gets it right about 69% of the time with a variation of about 5%. The variation isn’t too bad here, but the accuracy has hardly improved at all (Exercise for the reader: why?). Let’s see if we can do better using random forests. As discussed earlier, a random forest algorithm works by averaging over multiple trees using bootstrapped samples. Also, it reduces the correlation between trees by splitting on a random subset of predictors at each node in tree construction. The key parameters for randomForest algorithm are the number of trees (ntree) and the number of variables to be considered for splitting (mtry). The algorithm sets a default of 500 for ntree and sets mtry to the square root of the the number of predictors for classification problems or one-third the total number of predictors for regression. These defaults can be overridden by explicitly providing values for these variables. The preliminary stuff – the creation of training and test datasets etc. 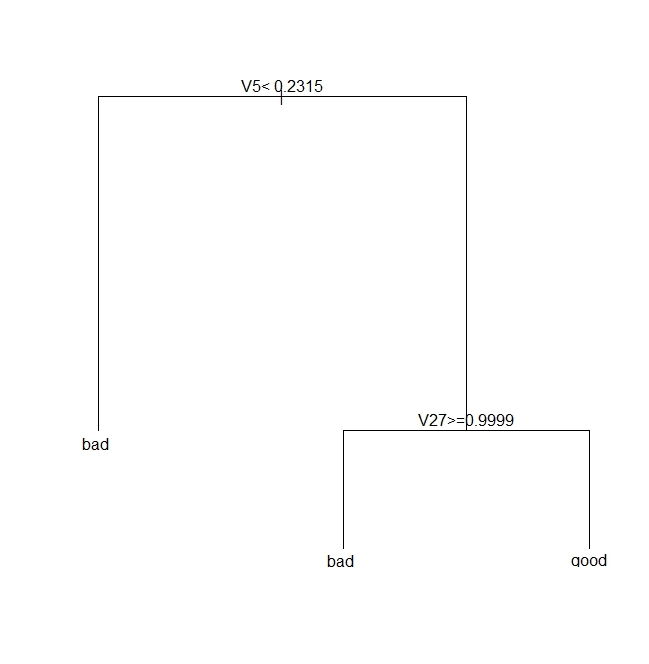 – is much the same as for decision trees but I’ll list the code for completeness. The first thing to note is the out of bag error estimate is ~ 24%. Equivalently the hit rate is 76%, which is better than the 69% for decision trees. Secondly, you’ll note that the algorithm does a terrible job identifying type 3 and 6 glasses correctly. This could possibly be improved by a technique called boosting, which works by iteratively improving poor predictions made in earlier stages. I plan to look at boosting in a future post, but if you’re curious, check out the gbm package in R.
The test accuracy is better than the out of bag accuracy and there are some differences in the class errors as well. However, overall the two compare quite well and are significantly better than the results of the decision tree algorithm. Random forest algorithms also give measures of variable importance. Computation of these is enabled by setting importance, a boolean parameter, to TRUE. The algorithm computes two measures of variable importance: mean decrease in Gini and mean decrease in accuracy. Brief explanations of these follow. When determining splits in individual trees, the algorithm looks for the largest class (in terms of population) and attempts to isolate it first. If this is not possible, it tries to do the best it can, always focusing on isolating the largest remaining class in every split.This is called the Gini splitting rule (see this article for a good explanation of the rule). where is the fraction of the set that belongs to the ith category. Clearly, is 0 when the set is homogeneous or pure (1 class only) and is maximum when classes are equiprobable (for example, in a two class set the maximum occurs when and are 0.5). At each stage the algorithm chooses to split on the predictor that leads to the largest decrease in . The algorithm tracks this decrease for each predictor for all splits and all trees in the forest. The average is reported as the mean decrease in Gini. The mean decrease in accuracy is calculated using the out of bag data points for each tree. The procedure goes as follows: when a particular tree is grown, the out of bag points are passed down the tree and the prediction accuracy (based on all out of bag points) recorded . The predictors are then randomly permuted and the out of bag prediction accuracy recalculated. The decrease in accuracy for a given predictor is the difference between the accuracy of the original (unpermuted) tree and the those obtained from the permuted trees in which the predictor was excluded. As in the previous case, the decrease in accuracy for each predictor can be computed and tracked as the algorithm progresses. These can then be averaged by predictor to yield a mean decrease in accuracy. The plot is shown in Figure 1 below. In this case the two measures are pretty consistent so it doesn’t really matter which one you choose. Random forests are an example of a general class of techniques called ensemble methods. These techniques are based on the principle that averaging over a large number of not-so-good models yields a more reliable prediction than a single model. This is true only if models in the group are independent of each other, which is precisely what bootstrap aggregation and predictor subsetting are intended to achieve. Although considerably more complex than decision trees, the logic behind random forests is not hard to understand. Indeed, the intuitiveness of the algorithm together with its ease of use and accuracy have made it very popular in the machine learning community.